One of the things I love most about attending board game conventions is being able to meet with game designers in person. You might think they’re all cut from the same mold. Surprisingly, they aren’t. Some are shy, humble, intellectual or reserved. Others are very precise with their conversations, focusing on keeping conversations on point. Then there’s the creator of Trainmaker. As you can see from the photo above, he’s far from shy and definitely not reserved. The best way to describe game designer Chris Leder is that he’s engaging, caring, goofy, easily distracted by shiny objects and fun. Oh, and creative. We can’t forget that! He created the incredibly successful dice game, Roll For It! 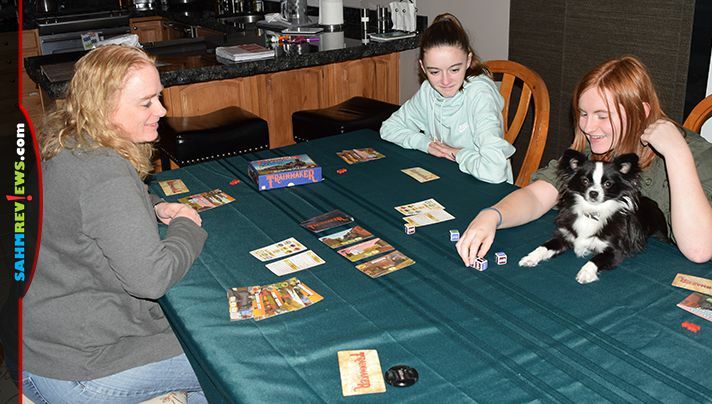 which we featured in our 2015 list of family games as well as City of Gears which you saw in our second guide to family games this past holiday season. 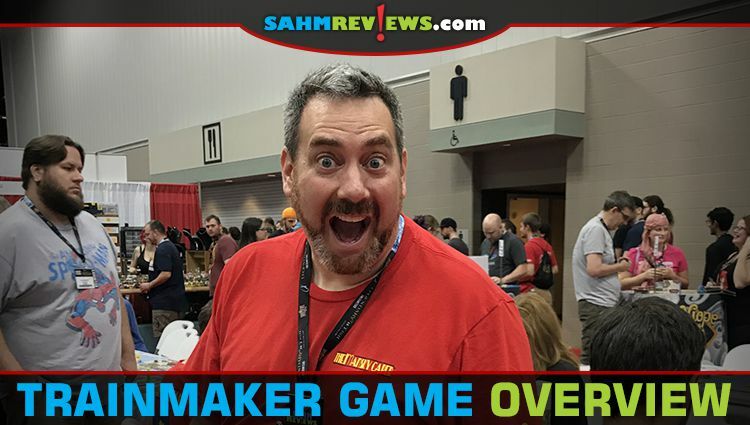 So it came as no surprise that we like one of his latest releases, Trainmaker from Alderac Entertainment Group (AEG). It’s utilizes the concept of rail expansion across the US that we saw in Boxcars, Ticket to Ride First Journey, Whistle Stop and The Last Spike and crosses it with Roll For It!. 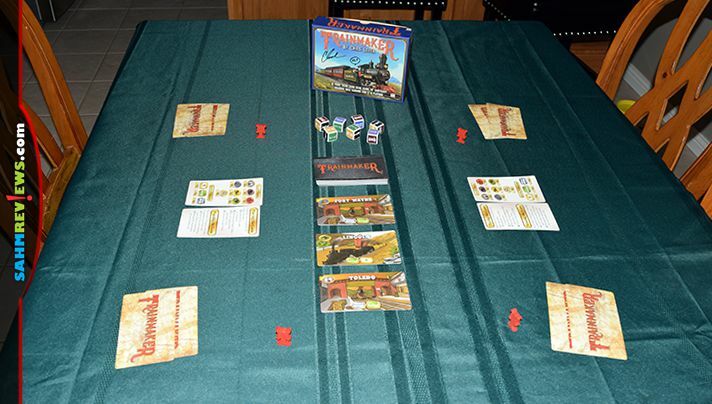 Trainmaker is a quick game that plays up to six people and only takes about 10 minutes to play. Setup is equally as simple. All you do is shuffle the contract cards and give two to each player, shuffle the City cards and form a stack in the center of the table, provide each player with a Switch Track Token then give the dice to whomever is going to be the first player. That’s it. There are seven train dice, all exactly the same. Two of the sides display black Locomotives and the other sides are a blue Passenger Car, a yellow Boxcar, a green Flatcar and a red Caboose. 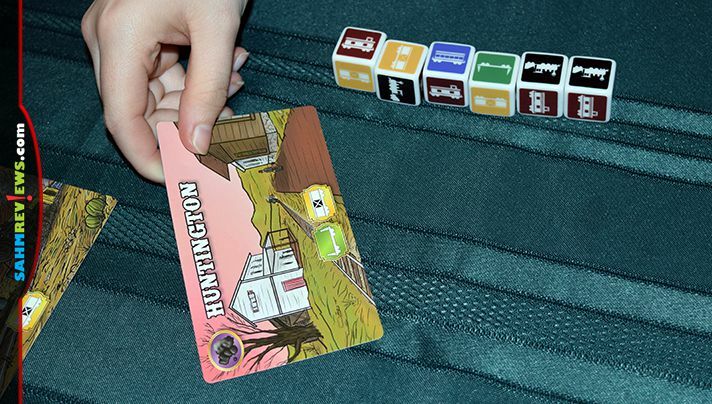 Using the dice, you’ll be trying to assemble trains in order to deliver goods to the various cities across the country. At the beginning of your first turn, you’ll examine your two contract cards and determine which you want to try to accomplish. 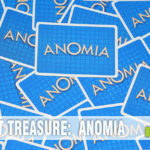 The winner of the game will be the first person to either complete their contract or collect one of each of the different types of goods depicted on the City cards. So let’s talk about those City cards. On the top left of each card is the city’s name and the top left depicts what type of good they are seeking. The bottom center of the card shows what type of train cars will be need to make the necessary delivery. As an example, the one on the far right of the picture is Missoula. They’re seeking wood which can be delivered with two Flatcars. Lexington is a little more difficult to achieve as it requires the same as Missoula but also needs a Boxcar. St. Louis is the most difficult because it’s a Wild card which can represent any type of good in the set collection process. To start your turn, you’ll make sure there are three City cards available for deliveries. Next, you’ll roll the dice in an effort to create the appropriate trains for the available cities. You’ll start from the engine at the beginning of the train and work your way from left to right until you’ve completed your train with a caboose. As in real life, you start with a locomotive and can’t randomly rearrange or add train cars to the middle of the train. Keep that in mind as I explain how the process works. On your first roll, you MUST roll a locomotive and at least one stock car (boxcar, flatcar or passenger) in order to proceed. If you don’t, then your turn is over and play passes to the next player. If you do, you may begin your train and add any cars needed to fulfill the minimum requirements on a City card. You may press your luck by rolling the remaining dice in an attempt to earn the necessary cars. As long as you can add one additional car to the train, you may continue. In order to claim the city, you’ll need to finish your train with a Caboose. The number and order of stock cars in between the Locomotive die and the Caboose die is irrelevant as long as you’ve met the requirement. You may claim the City card. However, if you don’t roll an additional stock car or are unable to complete the train with a caboose then your train derails and your turn is over. There are a couple additional things worth noting. You may turn in your Switch Track Token to change the face of one die at any time. But it’s not lost for good. 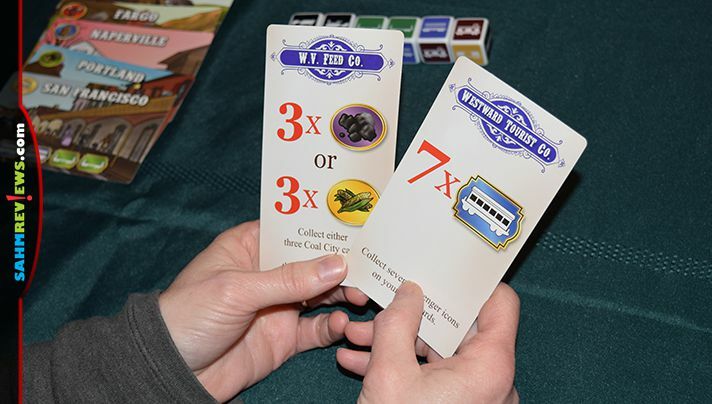 If you don’t roll any locomotives on your first roll of your turn, not only is your turn over, but you’ll earn a new Switch Track Token as a consolation prize. Locomotives are special too. If you are able to begin your train with two locomotives (in addition to the required stock car) then your train has a little extra umph. I think I can, I think I can… If you successfully complete a train with two locomotives and are able to claim a City card, then your train keeps on chugging to another city! You may re-roll all the dice used to create that train in an attempt to deliver to one of the remaining cities. All the same rules apply to this train except you won’t be able to reclaim a Switch Track Token. 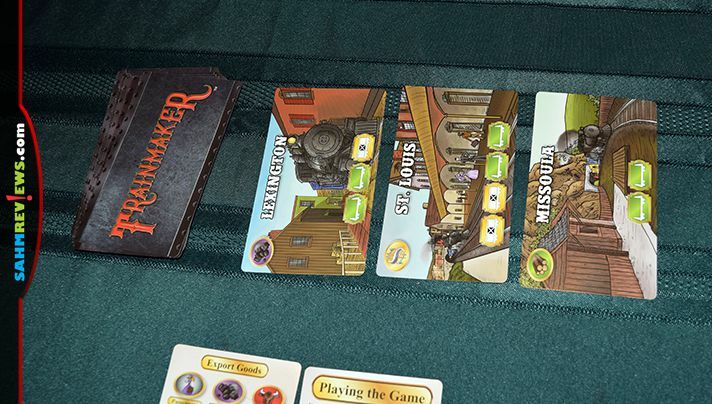 There’s definitely a lot of luck involved in Trainmaker, but there is some strategy required to determine whether you should press your luck or take an existing city. The box claims it’s a game for ages 14 and up, but any kid that can play Yahtzee is capable of joining. The quick timeframe makes it a great filler between other games and excellent for introducing new people to non-mainstream games. You can take a ride over to Amazon to pick up a copy of Trainmaker or buy direct from AEG for $25. Visit their website to see what else Alderac Entertainment Group is delivering to cities around the country. Hop over to Twitter and Facebook to read more. When was the last time you sat at a railroad crossing and counted the number of cars? I’ve stayed away from train games mostly but this could be interesting. I miss playing board games and the Trainmaker looks like a cool and fun game. Will try to check if have this locally. I would rather have my kids play this then being glued to their ipads. Wow, Trainmaker looks like a fun board game for the whole family. 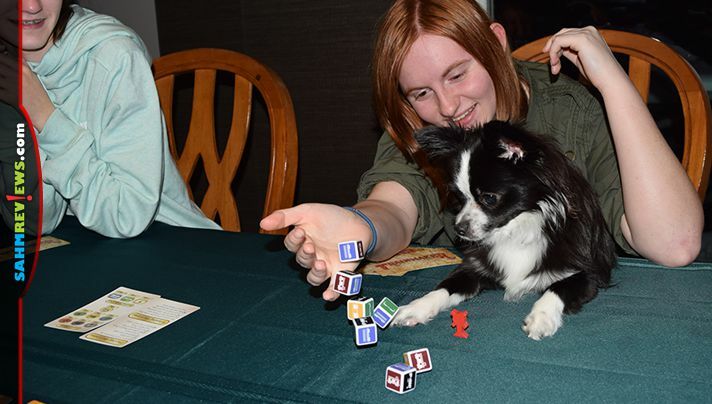 Even your pup seems to enjoy playing! My 3 year old grandson is fascinated with trains and I guess it rubbed off on me. I think this would be a great family game. We’ll just have to make sure we play it while my grandson is asleep or else, he’d run away with the dice. My siblings and I used to play a lot of board games when we were young. I kind of miss those days. I think I will get this trainmaker dice game. 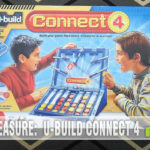 On our next family get together, I will make sure we reminisce our childhood by playing a game like this. That train game looks awesome! I love games with great artwork and something about those beautiful train cards makes me nostalgic, but I can’t quite put my finger on it. In my opinion, the more bizarre the creators, the more fun and clever the inventions/games. This game does sound like fun! It takes us on a twisting, curving, ride with all the bells and whistles! Toot! Toot! The description also sounds like a big kid created it! I can’t remember the last time I sat at a railroad crossing and counted the trains…lost to the mists of time. I think my small and tall guys would love this game! Last train game I played, I flipped the board. 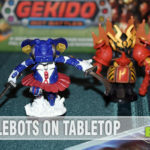 When I was reading your review, I immediately thought about the games Yahtzee and Monopoly, because you have to have a lot of luck and some strategy to play Trainmaker. 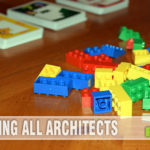 It involves acquiring land and building the train. It’s hard to believe that this game only takes ten minutes to play! Is that with 6 players also? This was pin worthy! Thank you for sharing. It’s been a while since I counted cars…. usually just sit impatiently these days.